Looking at doing: Aguero/Ings/Hazard->Auba/Rashford/Son for a 4ph. I wouldn’t be taking Aguero out for a hit. Ings may be back for the weekend so I’d look at Success if you want to ditch a striker. Would say Haz & Sane for Son & Pogba. And maybe even Success to Jimenez/Rashford for a hit. Worry about Aguero/Auba next week. Ings doesn’t look as though he will be back. My concern is whether Pep will play Aguero this weekend. Auba has an easier fixture. Would have thought that, with Auba having the easier fixture, that he would be a better option that Aguero this weekend. I intend on waiting till friday before I do my transfers, but I dont think it looks good for Ings. Anyone else think my transfers are a good move? I’m in my usual sit on my hands mode and so will probably keep Kun for GW26. It is however hard to argue against Auba having the better fixture. And what about Hazard/Ings->Son/Rashford for a 4ph? You know how I recoil when I hear the word ‘hit’, Hammerfan. In fact my vision went a bit blurry writing that. Unless Ings makes a miraculous recovery, it will have to happen. Plus, Rashford is a possible captain choice. If you’ve Auba, and Salah, then you have two outstanding captain choices. With Salah edging it I’d say. Thats why you are one of the respected ff’ers on here Kralin. I do have TAA, so can go 4-5-1, hoping that Camarasa plays, if Ings doesnt. Leighton Baines is unavailable which mans Digne will in all probability start. Everton are also without Mina & Jagielka. Gueye is available. For City, everyone is available aside from Kompany & Mangala. Many thanks AT, great stuff mate. Oh wait…I didn’t realise that was just the intro, I still haven’t read the whole article. What defender at 5,8 or less would you pick at the moment? The other defenders are Robertson, wan B, Doherty and Bednarek…. A United defender? Or a Newcastle defender? Newcastle have some decent fixtures over the coming weeks have looked ok at the back. Lindelöf or Shaw crossed my mind, but also Pereira who got some nice fixtures…. Maybe even one of Kolasinac, Koscienly or monreal…. I would favour Kola and Pereira right now although niether defence looks to great at the minute. They have great fixtures coming up and attacking potential. Personally, i like Pereira. I also like TAA, but the injuries to Gomez and Lovren might leave the defence unsettled for a while. Though i believe playing a proper RB and being able to shift Fabinho/Milner as CMs will help a lot. Another shout is Duffy/Dunk. Brighton will mos tlikely only keep CS at home, but they both provide decent goal threats. The only downside is that my defense will turn weak/cheap. The original plan had been the Auba Kun hockey cockey which is currently been a success. Any suggestions fellas? Do the first two transfers and then just play billing and bennet? The Digne move is needed to upgrade Richarlison to Son. I can’t do the first 2 moves without raising cash to get Son. @Eagle, I wouldn’t worry too much about the worth of your defence, you are only changing Digne to Bednarek and it could be ok a positive move in the next couple of GWs in particular when we consider the blank in 27. Besides you and most will probably have a vastly different team come 31 or 32. I was a proponent of Auba to Kun and Kun back to Auba so I certainly wouldn’t let a huge haul change my thinking. I like them moves, I would wait for Wednesday just to make sure Pep is not messing with Sane’s minutes again before I did anything, but those moves make sense to me. +1 Cheers Mito. I will wait for tmrw before making any moves. If anyone wants to discuss chip strategy for their team, we can go over some of the pros and cons of these 4 strategies below. I know there is more ways and it also depends if you have used any of the chips already, but I do think however you are going to play it out you should already start leaning in that direction (FA results can change strategy) because the moves you make now will have a positive or adverse effect for the rest of the season. That includes the lead up to 31, the next couple of GWs could see us really score well if we play it right and still be ok for the blanks and doubles ahead. One of those with the fixtures included would be great!! I think it will be option 1 for me. Admittedly I currently have two players who will feature in BGW31. Added to that I’m possibly taking a hit this week and none of the players I plan on bringing in are currently scheduled for feature in BGW31. This leaves me with 5 FT’s to sort my team out for BGW31. If things stay as they currently are and only four games go ahead in BGW31 I’ll be happy enough with 7/8 players. For people who might be short on players I think that is where the other options could come into play. I am for option 1 if Chelsea lose in round 5 or Wolves lose tonight or in round 5 as that automatically gives me some extra players and all of sudden having 9 or 10 won’t be as hard, but if Wolves advance to quarters and I think they will and CFC reach Quarters it gets tricky. Think if managers look at their team carefully they might see one of the other options as very viable. The other day I slapped Smash for bringing up another option but looking through it yesterday, there really is many ways to go about it and some very appealing ones. It’s bloody hard to say right now. Looking at the options you’ve presented, I’ll probably play it something like option 2. All I know for certain is I’ll be holding onto those chips for now! @Gear, that I think might be the underground option that will gain some followers in the coming weeks. -Team doesn’t have to be weakened in the lead up to 31, which means you try and score as much as possible over the next few weeks without worrying about transferring out certain players. – You would definitely be using your TC and BB on DGWs and not hoping you get another DGW. – Using arguably your most important chip on a GW that might not allow you to buy a great side. The best players say Salah and possibly 2 other LFC guys would most likely already be in your side. So you could be using the FH to purchase Leicester, Cherries or Hammer players. – GW33 would require a bit of luck. Hoping that certain teams are knocked out so you don’t field a very iffy side. 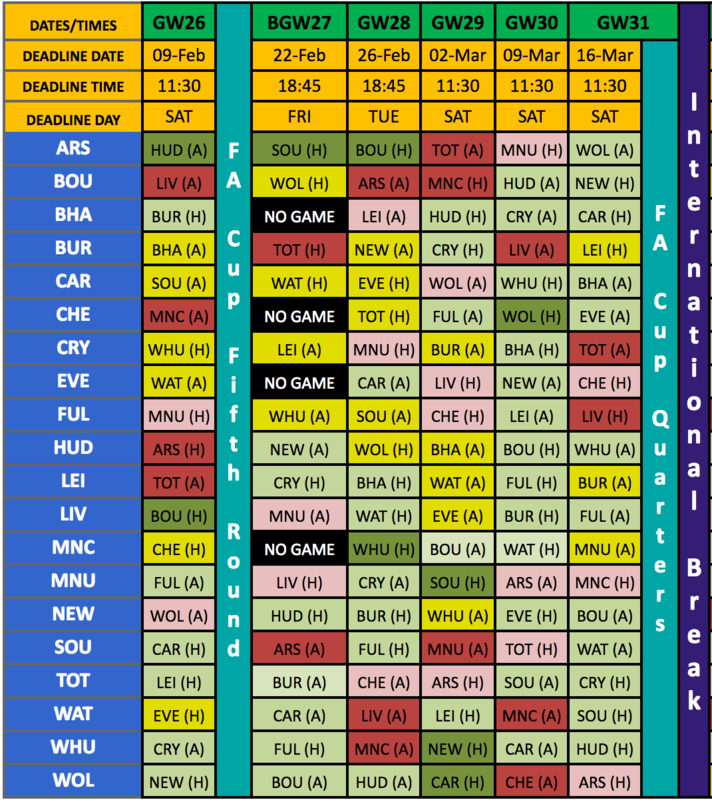 Transfer strategy: try to score as well as possible for now, but once you know results of the FA fifth round you could start gearing some of your transfers towards having DGW players for 32, the blank before it wouldn’t matter as you would use your FH that week and then recover your team for the DGW. Best part is you most likely be bringing in good players in the lead up to 31 and for 32 so you would have a strong side every GW until 33 which is a bit of lottery. One thing i’ve learnt,after the first blank gameweek of last year,is i won’t be filling my team with below par players in the lead up to Gw31 just so i have 10 or 11 players ! Agreed Brooky. That’s why I’m inclined to use the FH on a double rather than a blank. In saying that, I haven’t done any forward planning. If you use that FH in 32 that could mean 33 could be a mare though if you don’t have the FA games favour you. Nevertheless, I agree, I would certainly prefer to use a FH in a double than a BGW with weaker teams. Perhaps option 4 should be in play for you Kop. The free hit would be used in a blank but with much stronger teams in play and you would be ok for the big DGW in 32 and probably in decent shape for the DGW in 35. Ah here, I need to lie down. My head is starting to hurt!! Agreed, you sacrifice the 3-4 weeks before that and could easily see yourself lose out on 30-40 points or even more in the lead up just so you can have an extra Cherry or Fox that won’t probably score you much. To some degree we need to plan, but we have to know where the line is, if we guess that right we can come out way ahead by then end of the season over those who didn’t read it right. Another thing to consider is with the blank gameweek in GW27, you might already kind of prepare for BGW31 by getting rid of Chelsea, Man City and Everton assets… so it might not need too much additional work, which is why option 1 is tempting. Difficult to assess yet whether you would weaken your team too much in GW28/29/30. @Frenchie, you could be on your way to being ready for 31 because of 27, but at what expense is the thing. 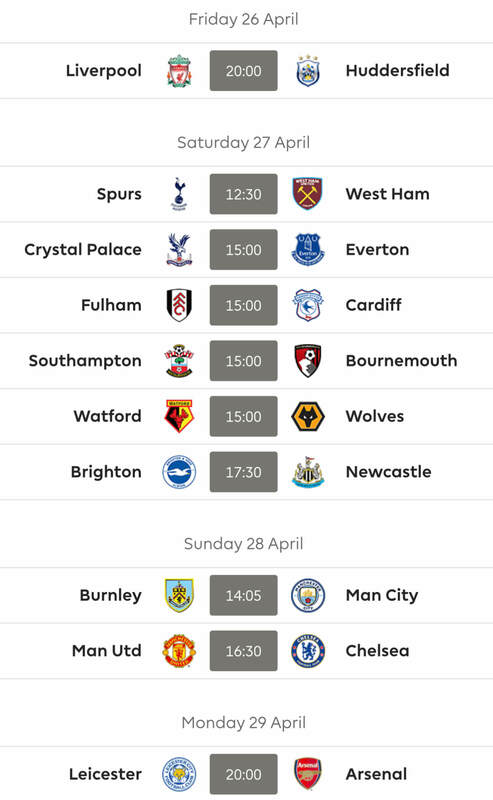 City play West Ham and Watford at home and Bournemouth away from 28-30, are we really going to miss out on those fixtures with our fpl teams? Plus CFC might not have a blank as they play United in the FA, so very possible that they don’t even have one. Their fixtures are not as appealing though. But like you said it is difficult to know just yet. 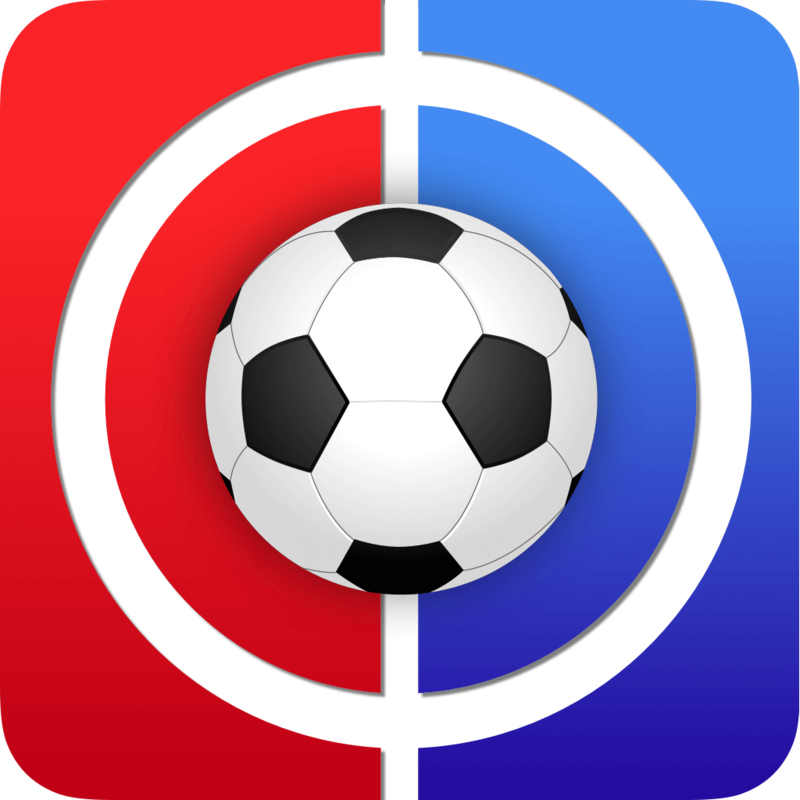 A Wolves loss today in the replay would certainly make it easier to navigate, but if you are on this site or any for that matter and spend a lot of time on fpl, I would say that should hope for chaos as you should be more prepared than most and should do better over those rough weeks, so I hope Wolves win and CFC beat United. Fair enough, Mito, it looks like Man City assets could be a key factor in these considerations indeed. I can’t see how I can avoid using my FT in GW31, I currently have no team. Interesting points about using it on a DGW to maximise coverage but I had planned to use TC or BB. What’s your team looking like right now EBC? @EBC, Yeah, I can see why you are thinking that way, you have Salah that plays in 31 but the 14 others don’t as of now. You would certainly receive a ton of help if say Palace lost to Doncaster as that would free up the SPurs players and Wan-bi then you could start to consider not using the FH as you could bring in 3-4 players and tackle 31 with 7-8 players, A Watford loss in the FA would also be helpful for you. I certainly be hoping Wolves and CFC progress if I were you as you want the rest of us being handicapped also. The thing that is putting me off bringing players with GW31 in mind is that they then won’t have a double in GW32. Would’ve been a lot simpler if I’d just TC’d Aguero this week. I suspect that what you have posted will be a sort of template side, you will basically be able to afford anyone playing that GW. Every manager has it a bit different depending on their current team and how fa results help or hurt them. I really don’t want to use my FH on 31 because it leaves me exposed to getting hurt in 33 where there will be much better teams in play on that blank, so I am trying to figure out how to navigate it. The FH in 31 will do wonders for 31, but it won’t be any help for 33. I’m hoping that there will be enough people knocked out of the cup to give me a team for GW33. The next round draw will hopefully do us a favour. 1) Want use use BB within 2GWs of WC. I went earlier with the WC last year, planning for the doubles and by the time they came round 3/4 players had picked up knocks and another 3/4 lost form. This all happened in the space of 4/5 gameweeks! @CDLS, I like the fact that you definitely use the TC and BB in the doubles. 1. agree, the longer you wait the harder it is to get a full side or close to use BB effectively. 2. In theory yes, but you won’t have much time to plan for it only having the FTs from 32 and 33 to work with. And if you played the WC in 30 to use your BB in 32 it probably means that you have a team full of people who will blank in 31 and to a lesser degree in 33, but still could be 7 or 8. 3. If you are chasing, you can’t catch up by doing what they do, so agreed. 4. Just play your game in 36-38, if you somehow managed to get ahead by then, I wouldn’t be messing with my form and copying others. The big problem/s I see is that the WC would be played with little account for 33, so you will need to be a bit lucky, plus the WC would also be played before FA cup QFs so you won’t know who is going to have two doubles or two blanks until after your team is set. You will only know about the blank in 31 and the double in 32. Very helpful, Mito21. Option 4 is the one that appeals to me – at the moment. One senses a hit or two along the way. Makes my head spin like Regan MacNeil’s. Think 32 is best for bench boost as more likely to have players with DGWs! @ELCFC, So basically option 3 except you will be missing the WC. Just means that you focus most of your transfers towards GW32. GW33 will be the make or break week for you (assuming you can get a good team in time for 32), if you navigate it without suffering too much you should be ok.
Made the wildcard with this in mind! Things like triple wolves and Man City with the thought they’d have the double. Also triple United if they get through too, so have the makings of plenty of DGW players for BB! I’m hoping that by GW30 we’ll have a much clearer picture. Having Wolves in 31 would be very handy indeed but not likely unless they field a weirdo XI v Bristol. My fingers are tightly crossed Wolves make it through! I admire your long-range planning and hope it pays off.